Since we are a privately-owned farm, all professional photographers (those who are paid for their services and/or bring props as part of the photo session) are required to pay for a daily permit. Apple orchard permits and photography sessions are only available end of August through October 31st, Monday-Friday 9:00am-6:00pm. No permits or photography sessions will be allowed on Columbus Day. Daily permit is $30. In addition to the permit, an apple bag purchase is required for all family and individual sessions. For more information, click on Keller’s Farmstand Oswego Apple Orchard. Photography session must be completed by 6:00pm, including cleanup. All photos will be taken in the Oswego apple orchard only. Climbing or shaking apple trees is not allowed. Only pick the apples you are buying. Backpacks, large purses or bags, ladders, and apple-picking poles are not allowed in the orchard. Since photography sessions take place during normal business hours, customers will be sharing the orchard with you. Photographers are required to sign the permit stating they agree to the rules and guidelines of the permit and Keller’s Farm. Photographers are responsible for familiarizing themselves, and informing clients, of permit/farm rules. We request that you inform us of your photography session 24 hours in advance by calling the Oswego Farmstand (630-219-8194). Session scheduling will not start until mid-August. Pay for the permit and apple bags in the Oswego Farmstand on the day of your session. Permits and all rules involved pertain to videography sessions as well. Supply and demand will dictate how long our apple season will last. 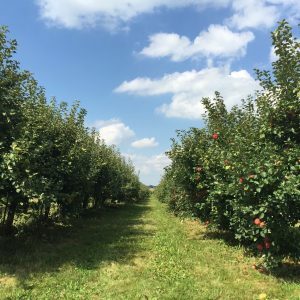 Please call the Oswego Farmstand (630-219-8194) for apple orchard conditions and apple supply.